Photos By: Benjamin Rogers Jr.
For the Wizards this home stand has been a little grueling and tonight it wasn’t any easier as they had to take an average Bucks team down to the wire to finally pull out another another victory, 110-105. 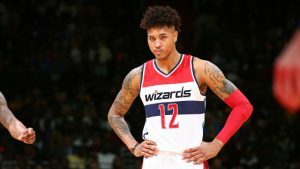 The shining star of the night was not someone named Wall or Beal, but the emerging Kelly Oubre who dropped 19 points (a career high) and nine rebounds in arguably the best game of his young career. Bradley Beal and Marfieff Morris chipped in with 20 and 15 points respectively. “Kelly is getting more confidence on the court every day. He is one of the hardest working guys in practice and wants to be a leader on this team,” said Wizards Head Coach Scott Brooks on his performance tonight. For the Bucks it was a 11-0 run by the Wizards that spelled their defeat. Giannis Antetokounmpo led Milwaukee with 28 points and 13 rebounds, but committed seven of Milwaukee’s 20 turnovers. Antetokounmpo’s two free throws gave the Bucks a 100-95 lead with 4:28 left, but the Wizards rallied while the Bucks went cold. The biggest note for the Wizards was they got an all around team performance for maybe just the third time this season. That 10th victory could come Monday as they travel Miami who has had its share of struggles this season and sits at the bottom of the conference currently.